Kenny Vaccaro was drafted in the first round back in 2013 and has yet to fulfill the potential that he showed when he was a Texas Longhorn. 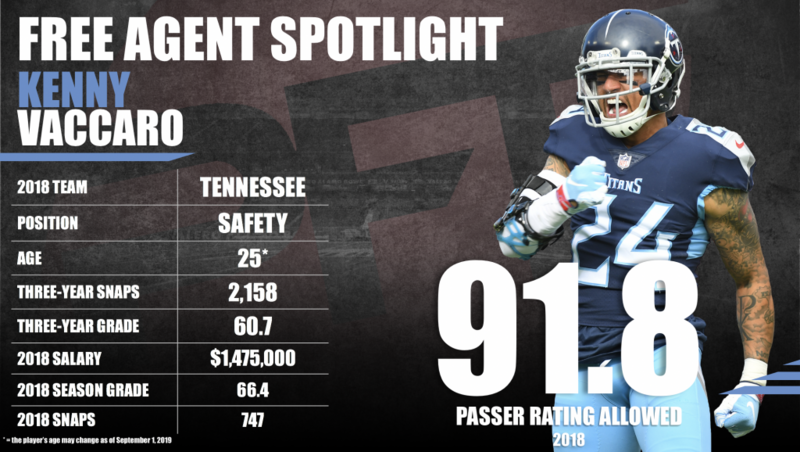 With six seasons under his belt, Vaccaro has yet to finish with an overall grade above 70.0, and that is mostly due to his struggles in coverage. However, Vaccaro has been serviceable against the run throughout his career, as he has finished with a run defense grade below 70.0 only twice in six years. Vaccaro is coming off his second-highest graded season as a professional (66.4 overall). He showed great tackling ability all season, and his tackling grade (80.5) ranks 21st out of 101 safeties. With only four missed tackles, Vaccaro averaged a missed tackle every 14.8 attempts, which is the 18th-best rate among safeties. As he approaches his 28th birthday, Vaccaro still has plenty of time to reach his potential; it’s just a matter of which team will help him get there. Subscribe to Pro Football Focus’ ELITE subscription to research Kenny Vaccaro’s grades, advanced stats, snaps and more in Premium Stats 2.0.